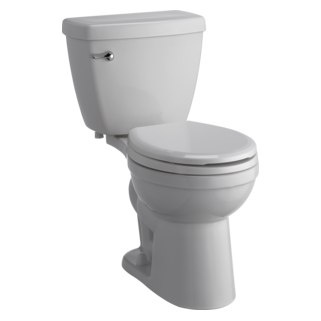 B512LF is rated 4.8 out of 5 by 8. Rated 5 out of 5 by Tom from Easiest Working Faucet I’ve Ever Had This faucet works so easily that you don’t need much strength in your fingers. I had to buy new flex water lines since the copper ones were welded to the old faucet. No plumbers putty or silicone is needed. The faucet comes with a good fitting gasket and all you have to do is apply plumbers tape to the threaded connections. I love it. 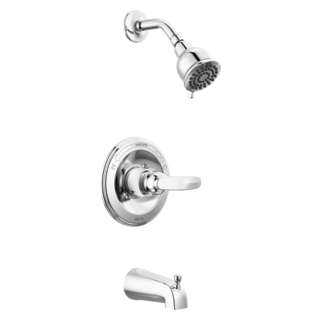 Rated 5 out of 5 by none from very easy Ordered the faucets without having dealt with the distributor before not knowing what to expect. I was pleasantly surprised when the faucet arrived very quickly and just as I had ordered. Very pleased with the process. Rated 5 out of 5 by Riccardo46 from Delta B512LF faucet This is a fantastic faucet on the proper type sink and vanity! It works smoothly and quickly with its single knob. It appears to have been made with the best metals and design. 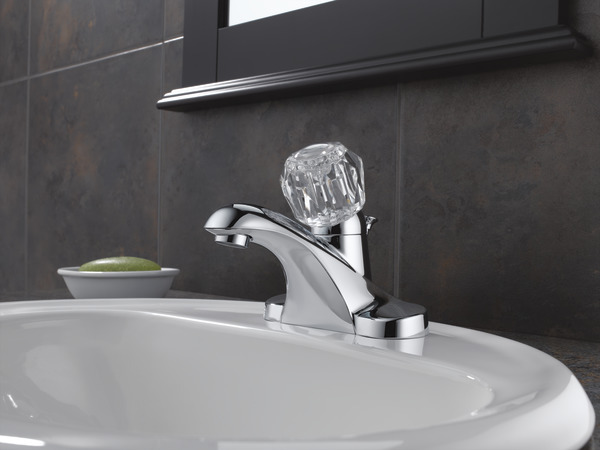 The previous faucet was an older Delta product that worked well for 30 plus years but had a more square design. Rated 5 out of 5 by Pete P from Easy to use! It is just like my old Delta! Would recommend to all! Rated 5 out of 5 by plum from faucets Just had a plumber install the Delta faucets today in the kitchen and one bathroom. Shopping with you was easy and convenient. I found just what I wanted to replace old Delta faucets that needed to be replaced. I would definitely shop with you again for plumbing supplies. Rated 5 out of 5 by docbrown from Great update. No problems installing. Newer update from older version. I need to replace the faucet handle caps for this model. I'm fairly certain this faucet is the same so the cap for this faucet might fit what I have. No one has the caps for the size faucet handle I have. I've exhausted my options. Can I buy here? What is a delta part # for the button? AFTER REMOVING THE KNOB HANDLE, I CAN.T GET THE HALFROUND PIECE LOOSE. I USED DW40 AND IT STILL IS STUCK. IS THERE A SPECIAL WRENCH FOR THAT? Thank you for your question. There may be hard water mineral deposits underneath your bonnet nut. We recommend soaking a towel in a 50/50 solution of white vinegar and water and then wrapping it around the bonnet nut overnight to soak it. You may also try a strap wrench to loosen the deposits. Is there anyway to adjust the temperature from this faucet without adjusting the hot water tank? If so, how? DOES THIS FAUCET COME IN BRONZE? Hello Chuck, Thanks for your question! Unfortunately, the B512LF is currently only manufactured in Chrome. Here is a link to all the single handle lavatory faucets we currently manufacture in the Venetian Bronze finish: http://www.deltafaucet.com/bath/lavatory/filter-results.html?finish=rb&amp;handle=type-lav-singlehandle&amp;sort=pricehighlow&amp;function=bath-lavatory I hope this helps! What is the part number for a bonnet nut for this faucet? I cannot get the bonnet nut loose and I will probably damage it irreparably in removing it. Thank you for your question. 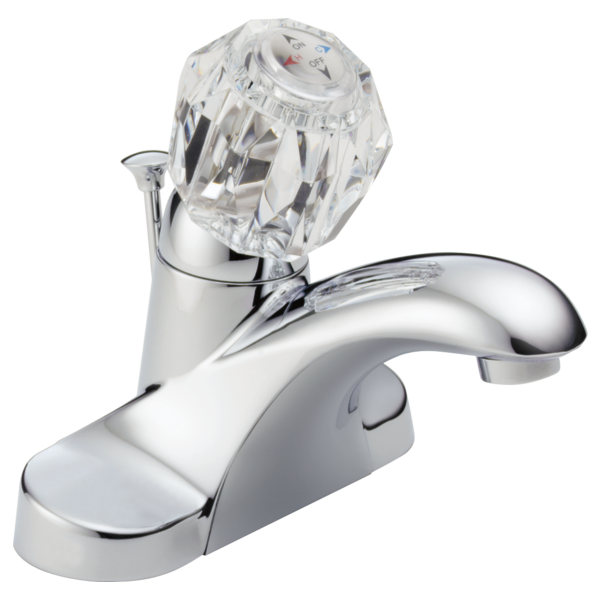 It is possible to switch from a crystal knob to a lever handle. The model number for the lever handle is RP42986. After you remove the crystal knob, there will be a connecter underneath that will also need to be removed before the lever handle can be installed. What material is this faucet made. 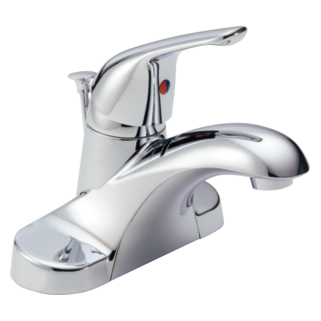 Many of the new faucets are made with plastic and other low quality materials. Is this faucet made of cast brass with chrome finish? Also can the flow rate be increased?